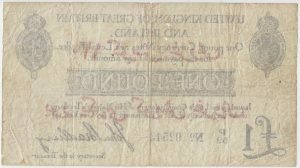 In 1915 the Allies had anticipated a quick victory at Gallipoli, and in planning the campaign the British, Australian and New Zealand troops were issued with banknotes with which to buy goods and services from the local population. 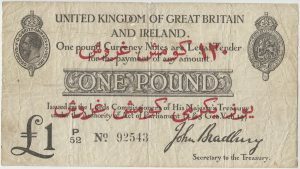 These were British Treasury Ten Shilling and Pound banknotes signed by John Bradbury and overprinted with Arab lettering, which explained in Turkish that the Ten Shilling note was exchangeable for 60 silver piastres and the Pound for 120 silver piastres. The prospect of an early victory soon dissipated and with no real contact with the local population the notes were quickly withdrawn. The Ten Shilling notes although scarce have survived in reasonable numbers backing anecdotal accounts that they were given out in far larger numbers to enlisted men, while the surviving Pound notes which are extremely rare were reserved for officers only.